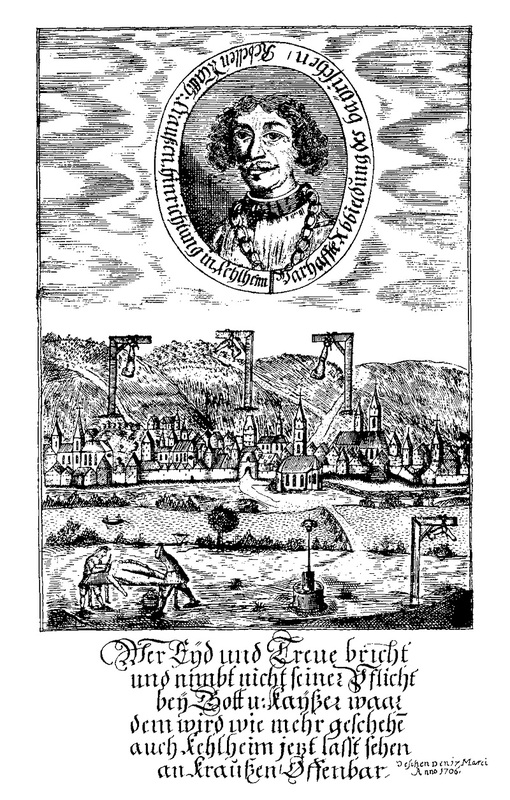 On this date in 1706, Bavarian butcher Matthias Kraus was beheaded and quartered for an anti-Austrian rebellion. This commoner was the victim at several orders’ remove of distant imperial politics; as such, he will enter this story only as a coda. Instead, we begin in the 1690s, in Spain, with the approaching death of the childless Spanish king Charles II. The question of who would succeed Charles presented European diplomats the stickiest of wickets: there were rival claims that augured civil war, which was bad enough, but such a war’s potential winners could themselves be scions of the French Bourbons or the Austrian Habsburgs … which meant that Spain’s world empire could become conjoined with that of another great European power and unbalance everything. For a while this whelp looked like the answer the continent’s schemers were searching for, since neither the state of Bavaria nor his father’s House of Wittelsbach was already a great power — and thus, they could be elevated without creating a new hegemon. But in 1699, months after the infirm Charles had designated the little boy “my legitimate successor in all my kingdoms, states and dominions,” Joseph Ferdinand too dropped dead. The boy was only seven years old — but he had lived long enough to whet his father’s appetite for a more substantial patrimony. When Charles II finally died in 1700 with the inheritance situation still unresolved, Max Emanuel entered the resulting continental war — the War of Spanish Succession — allying himself with France with the intent of supplanting the Habsburg dynasty on the Austrian throne. This was a bold gambit to be sure but in the war’s earliest years it looked like it might really work. The Elector of Bavaria parlayed his strong position on the Danube (and ample French support) into a menacing thrust into Austria that threatened to capture Vienna. For the Wittelsbachs, this would mean promotion to a higher plane of dynastic inbreeding; for France, it would mean a lethal blow to the rival Austrian-English-Dutch “Grand Alliance”. But things went pear-shaped in 1704. Marlborough mounted a famous march to Austria’s rescue and trounced the Bourbons and Bavarians at the Battle of Blenheim, completely reversing the tide of events. Bavaria now came under Austrian occupation, as Max Emanuel hightailed it to the Low Countries. All this statecraft brings us as a postscript the unhappy fate of our butcher, Herr Kraus. 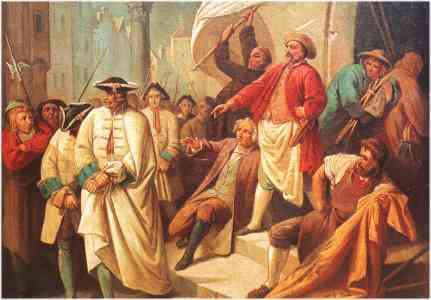 The Austrian occupation of Bavaria — complete with punishing wartime levies — triggered in 1705 a peasants’ revolt grandly titled the Bavarian People’s Uprising. Matthias Kraus was a leader in this rising. Like the Wittelsbach pretension writ small, Kraus was intrepid but doomed. Having seized the town of Kelheim with a force of 200 or so, he held it for just five days. Austrian forces appearing at the gate negotiated for a peaceful surrender of the city, but as soon as they got the gates open they ran amok in a general massacre. 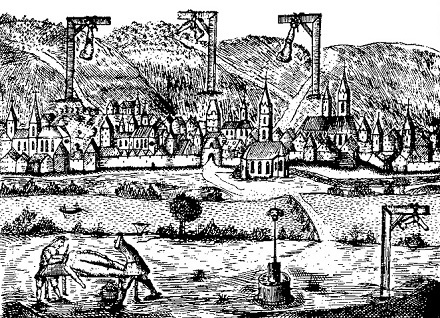 Kraus himself, interrogated under torture in Ingolstadt, was returned to Kelheim for public execution — his body’s quarters to be mounted around the city as a warning. Detail view (click for a full image) of an Austrian leaflet publicizing the fate of the rebellious Kraus. His martyrdom at the hands of a foreign occupation has stood Kraus in good stead in posterity. There is a Matthias-Kraus-Gasse in Kelheim, as well as a fountain memorial put up to celebrate the 1905 bicentennial of his his fleeting moment of heroism.